I have a confession to make: I, Yapp, love television. My favourite shows are House Hunters, You Gotta Eat Here, and last but not least– The Real Housewives of Beverly Hills. 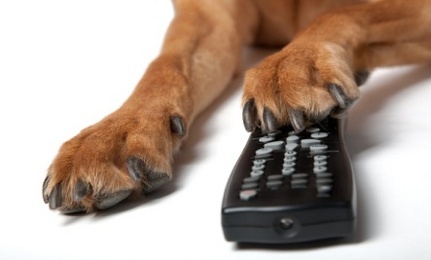 And while I love these shows, I’ve noticed a rather large minority missing from the small screen… Dogs! Sure, sometimes we get supporting roles, alongside humans. But for once, just once, I’d love to see a show for dogs, by dogs. Hear me out; like humans, we’ve got different personalities, different interests, and we’re always curious to see new things happening in the world. Dogs are eager to learn new things, so why not start a channel that’ll get your pup’s attention and teach them something useful? We demand equal representation! Dogs, as well all know, are pretty smart. Take Chaser, the border collie– he was able to remember over 1,000 different objects by name, and was able to retrieve them. How about a show that teaches dogs how to remember cool stuff? I know that I’d watch that in a heartbeat. And even though I can’t get enough of regular human cooking shows, I’d love to watch a show dedicated to dog treats! Or a House Hunters episode, just for dog houses? I could go on for days. DAYS! Someone put me in touch with NBC, I think I’ve got a long career of doggy television-production ahead of me. And I’m not alone in this one; I have sooo many other puppy friends who agree with me. But I’m curious to know: What do you guys think? Is Puppy TV rad, or bad? Leave a comment below!